I confess I didn't like the Safari browser in its earlier versions, nor the fact that iTunes kept pushing it in my face everytime there was an iTunes update. I resisted. 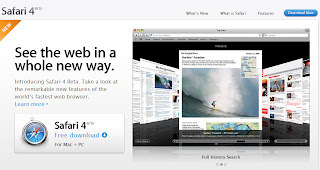 Today I've been playing with Safari 4 and I must admit this is a major step forward in speed - compared to Firefox at any rate. As Firefox has added plug-ins, so it becomes terribly buggy - and it is not easy to reboot when it hangs (at least on a Vista 64 machine). Of course, its too early to dump the others - my bank doesn't recognise Safari, and there are a few useful plug-ins not available yet for Safari. But so far, so good. I've been playing with a new application just launched on iTunes from French external broadcaster, France 24. It is free on iTunes if you search for France 24 live application. In fact, there's some other stuff if you search for France24, without the space, so perhaps they should standardise on their nomenclature. claims that FRANCE 24 is the first channel worldwide to pioneer this ground-breaking service. While other stations are launching applications, I haven't seen one to grab live over the air content quite like this. Since the station is global, there are no rights restrictions. Does it work? Yes, very well. Both the sound and picture look great on an iPod Touch. And its free to download and free to use. Compare that with the NHK World approach which seems to view the web and satellite TV as two completely different worlds. UPDATE: France 24 announced Feb 24th that its application has now been approved for the 3G networks by Apple, so on the iPhone you now have a choice of accessing the station via 3G or the wifi. Since its launch on the Apple App Store on February 8th 2009, the FRANCE 24 LIVE application has been downloaded more than 100,000 times around the world. Of all the free news applications available on iTunes, FRANCE 24 LIVE ranks among the top 10 worldwide; most notably in the USA, the UK, Germany, Spain, Italy, Israel, South Africa, the United Arab Emirates, India, Brazil, etc. BBC Mobile said at MWC Congress Barcelona last week (Feb 19th) that they have been experimenting with an Apple iPhone ap for radio, but have not released it to the public just yet. Labels: "France 24" "France 24 live application"
• Work closely with the Ministerial Group on Digital Engagement, delivering the work agreed at Cabinet on digital engagement. Salary tops at 160,000 quid a year which isn't bad for twittering on Gordon's behalf. This looks rather like an expedition to Africa to try and find out whether it exists and poses any threat. I love the term though, as if it replaces a post called "Director of Analogue Engagement". Labels: "Director of Digital Engagement"
Where does one start? What language do they think it is in now? Is Facebook insulting its users? We've noted before some of the stupid antics of Sirius XM satellite radio company, especially the wild success claims from the Sirius side before the merger. New York Times is reporting that the satellite radio company is now preparing to seek Chapter 11 protection over the next few days. Whilst this doesn't mean the end, it certainly heralds a reality check. The paper says that Sirius XM has been working with a restructuring specialists on strategies for dealing with $1 billion in debt repayments due this year. It comes as media mogul Charlie Ergen has been buying up shares, fueling speculation of a hostile takeover attempt. Frankly, with all the other options for entertainment in the car, pay radio looks the most vulnerable when times are tough. Pride comes before a huge fall. It seems that "tens of thousands" of people are already making use of the "Missed the Broadcast" service launched a few weeks ago by Netherlands Public Broadcasting as part of their TestLab. A programme called "De Wereld Draait Door" (Life Goes On) and the NOS News Journal are the most popular on-demand shows and the viewing peak is around 22 hrs local time. William Valkenburg, Director of Internet Coordination at the NPO said at a congress in Hilversum, Tuesday that their department offers two services, either via a special mobile site or through an application. He expects the service to grow gradually. In January, more than 86,000 streams were requested. The application has been downloaded 15,000 times, and the number of unique users is around 35,000. The application runs on around 362 different models of mobile phone, with a special application for the Blackberry Storm & Bold being launched next week. The on-line edition of the Dutch-language magazine Emerce is reporting that the ING Bank has done a deal with the Austrian company of Mobilizy which allows you to find the nearest ATM machine on your G1 phone from where you're standing. ING banks are marked on a map with the orange-lion logo of the bank, but other banks are shown too with a generic logo. The app runs on the Google G1 Android mobiles that are starting to roll out here. But playing with it lead me to the Austrian company's demo of what else the software can do. Further down the road I see all kinds of interesting possibilities if broadcasters couple their content databases with apps like this. By pointing the camera in the phone to an object, the device displays any information it knows about what it sees. Oh dear, it looks like the NHK relaunch was limited to the TV network. The website remains a very distant second to the satellite network. 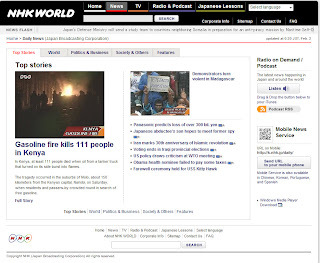 BBC World News, CNN, and France 24 seem to be leading when it comes to web presence and true cross-media thinking. Al Jazeera is advanced when it comes to mobile and web 2.0 apps, but their English language website is very difficult to navigate, especially if you're looking for something by subject rather than by time. NHK appears to be well behind in all of this - blaming copyright as the reason for not offering their premium service on the web. If it was 1999 I could understand, but ten years on it seems incredible that they haven't sorted it all out. Japan is a world leader when it comes to mobile technology and banking systems. So do they have a chance at being in the same league soon as BBC, CNN, as claimed at the relaunch. Definitely not, judging from this. NHK World - a few hours to relaunch? NHK is hoping its relaunch today February 2nd will put it in the same league at BBC World News and CNN. Frankly, the only way they can go at the moment is up, since it is rare to find a service that's so devoid of context. I haven't seen them do live dicussion events - its just newsreaders with autocues linking pieces. The Japanese international TV channel NHK World is to introduce hourly news bulletins in English, starting February 2. A carriage agreement with Sky Digital in the UK brought the number of homes in which NHK World is available to over 80 million and NHK says they are aiming for 110 million homes by the summer. But they have to fix the website....seriously dull comes to mind. When I checked at midnight Amsterdam time on the 2nd, they were still showing a page which hadn't been updated in 8 hours. I presume the relaunch will be later in the day. Interesting claim on the Al Jazeera banner ad. Personally, I prefer their satellite TV service. I think France 24 and BBC Global News beat them to it. Labels: "BBC Global News" "Al Jazeera"